Take our OSHA/GHS & HIPAA Compliance Quiz today to find out where you stand! This package is designed for OUR EXISTING CLIENTS ONLY. NEW Updated Do-It-Yourself Annual OSHA Employee Training on Video. OSHA video viewing. You will get the test link with the OSHA Video Link. The questions are easy! Don’t sweat it! OSHA Web-link will work for 90 days …. OSHA Inspectors. We’re there for you every step of the way. reach us at info@dentalenhancements.com or 941-587-2864. Dental Enhancements provides legally useful OSHA, HIPAA and practice growth information, products and services but does not give specific legal advice. By purchasing and using our products and services, you acknowledge that Dental Enhancements is not an attorney and suggests that for resolution of specific legal problems you contact an attorney specializing in these areas and licensed to practice law in your particular area. If you are pending an immediate OSHA inspection, please call our offices to discuss your situation as additional fees or requirements may apply. Dental Enhancements has the right to recommend you seek legal advice in lieu of training and protocol guidance. Renew your Annual OSHA Employee Training via a 50-Minute Pre-recorded Video at your convenience! (Printable sign-in certificate included). 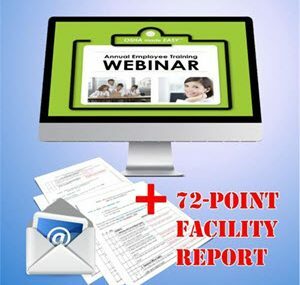 Then update your prior 72-Point Facility Inspection & Report. Unlimited Phone Support for 1 year included. Copyright © Dental Enhancements. All Rights Reserved. Website design by S3 Media.